Splendid leaf divided into five compartments; before 1909 part of a fine Book of Hours (New York, Morgan Library and Museum, ms. M.1003). Only a brilliant master could have painted this great piece of art. In a golden and orange aureole formed by seraphim, God the Father sits on his heavenly throne. One step lower sits baby Jesus holding the cross. Shown in his human manifestation, the child is a symbolic reference that Christ is ready to descend to earth to fulfil his sacrifice. Two female saints stand to the right and left, worshipped by hundreds of angels. The text announces that God sent the Angel Gabriel. While Mary sits in her cell reading, St. Luke records the story on a text scroll. Souls in purgatory wait for their deliverance. 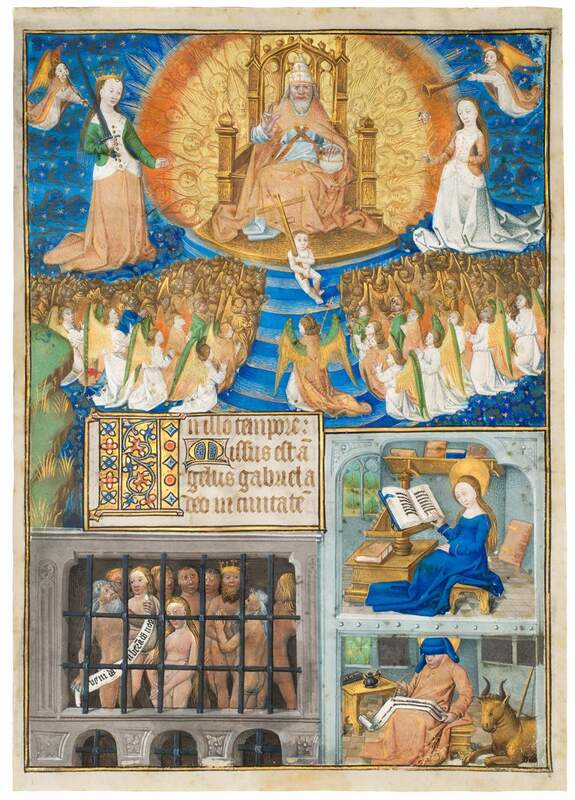 The illuminator’s work recalls Hugo van der Goes and shows knowledge of compositions and models by Rogier van der Weyden, suggesting the artist came from Flanders before he settled to work in Paris. At one time this leaf was a part of a Book of Hours now at the Pierpont Morgan Library, Ms. M. 1003. This work has now rejoined its original book in the Morgan collection as Ms. M. 1207.